We are starting our regular marathon today 3 days a week. I have taken North Indian side dishes as my Week 1 theme. 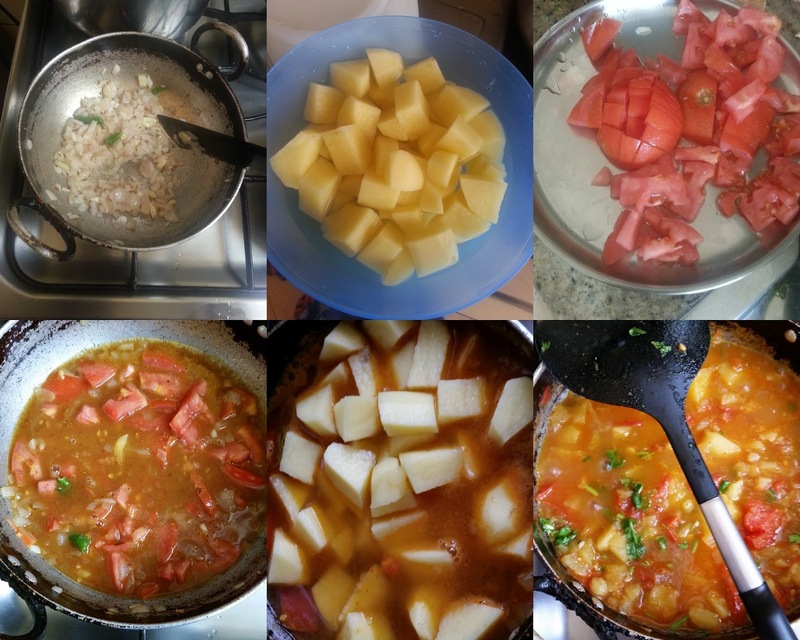 i immediately decided on what to make, first on the list was this juicy aloo ke jhol. A simple potato subzi cooked with onion and tomatoes and simple spices and made a bit runny or soupy consistency. The curry sounds simple, but the taste is out of the world. So, when you are out of time and need something interesting on the Dinner table, then it is definitely this one. Wash, Peel and cut the potatoes into cubes. Heat 2 tsp oil in kadai, splutter cumin seeds, next add chopped onions, garlic and green chili and saute until onions turns translucent. Then add chopped tomatoes, add red chili powder, turmeric powder and garam masala powder. Let the tomatoes cook until soft, add the cubed potatoes, salt and 1 cup of water. Cover and cook until potatoes are soft. aloo ka jhol looks lips smacking priya :) I want that bowl with hot chapathis right now , its mid nite here and you are making me hungry :) very delicious pick from north indian curry !! Delicious pic Priya. I wanted to see it in the Office itself but the mobile was not cooperating.I will love this with our pav too. This is a great recipe when you need something last minute. Nice one. This is a great recipe when you need something last minute. Tastes great too. Lipsmacking aloo ke jhol, hard to resist to this beautiful side dish..i can happily have some pooris with this dish. Lip-smacking aloo jhol, Priya! Goes very well with Puri, right? A tempting aloo curry. Nothing can go wrong with potatoes. i love these jhols..and potato one is an all time favorite..super. A tempting dish and lovely pic. Very simple and flavorful curry. This sounds so easy to make. Tempting pic. I love this side dish priya, I had made couple of varieties during Indian States...nice one.. Such a lovely simple recipe Priya! !